Wherever did you find all this information, you might be thinking just now, or, maybe you are wondering, why do you care? 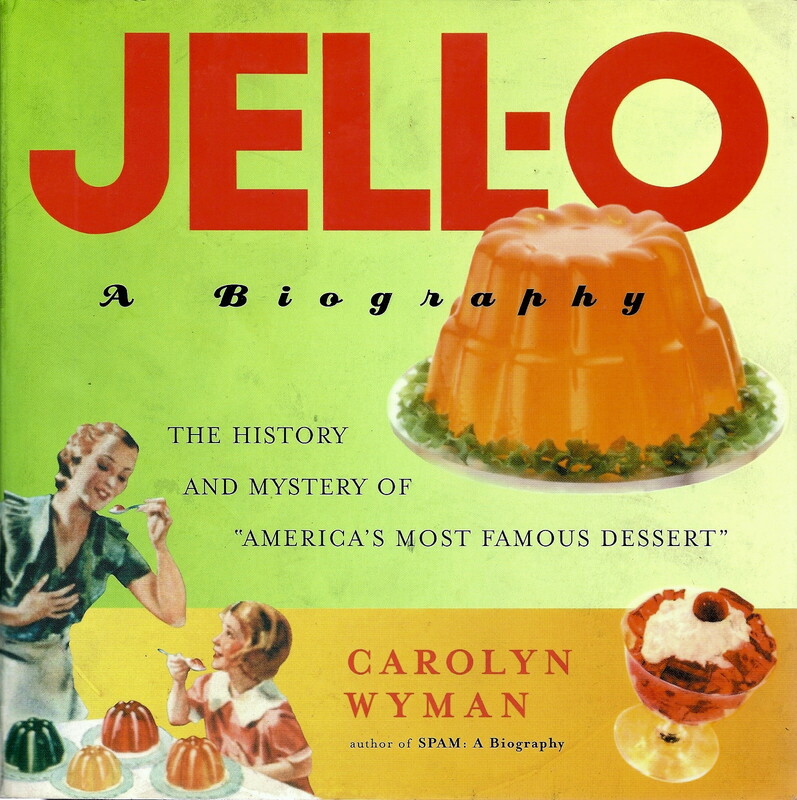 I received a wonderful birthday present nearly 10 years ago from a friend, Jell-o: A Biography, by Carolyn Wyman. You might know her as the author of SPAM: A Biography. While I do not use this superbly researched book often, it is entertaining, informative, and fascinating. For instance, peach was introduced in 1907, discontinued in 1930, and re-introduced in 1975, which was three years before the introduction of apricot. I also checked out the official Jell-o website to ensure that apricot Jell-o is, indeed, still available, in theory. So the apricot flavour debut in 1978 makes me think this recipe dates from that time or later; however, there is the possibility that a competing brand, e.g., Royal, had apricot prior to then. It makes sense that this is a 1970s recipe, as Jell-o 1, 2, 3 was a big hit in those days: a self-separating layered preparation, which gave three layers from one easy-to-make box. Thus, Jell-o with a whipped dairy addition would have been a la mode back then (no, not with ice cream on top but fashionable). 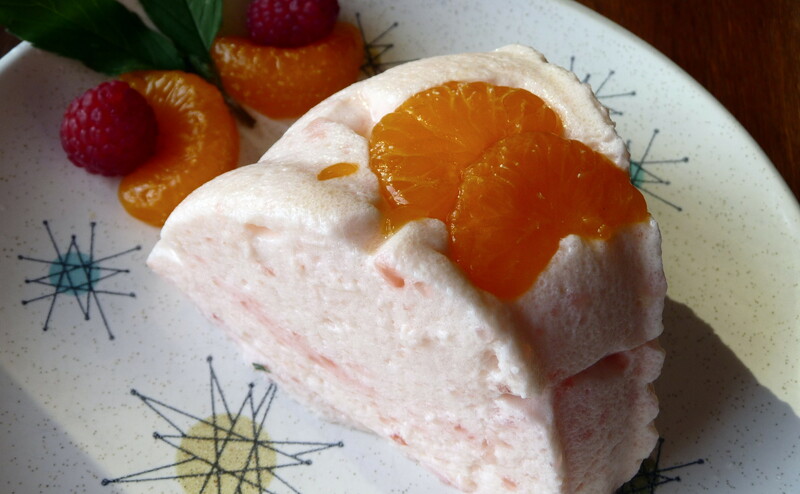 As for the “apricot mold”, I found it super-quick and easy to make, especially with a stand mixer. However, a hand mixer or even an old rotary beater could work just as well. The “Pet milk” is another trade-marked name for evaporated milk, and I never knew that it could be whipped to soft-peak consistency of whipped cream!! 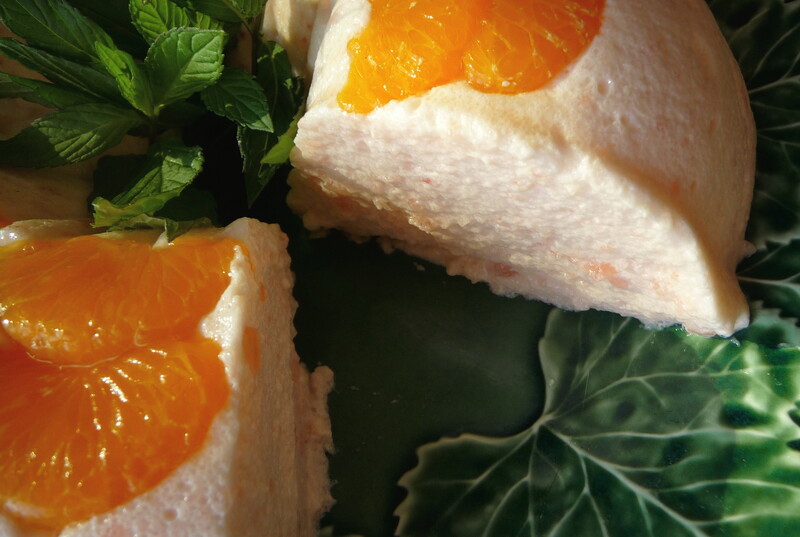 The dessert has a lighter-than-air chiffon-like texture, with just three ingredients: the Jell-o, evaporated milk, and mandarin oranges, which I am pretty sure Jessie used over the apricots. I had nutrition profiles for these three items, and I am happy to tell you that it makes a relatively low-calorie dessert of 160 calories per large serving. 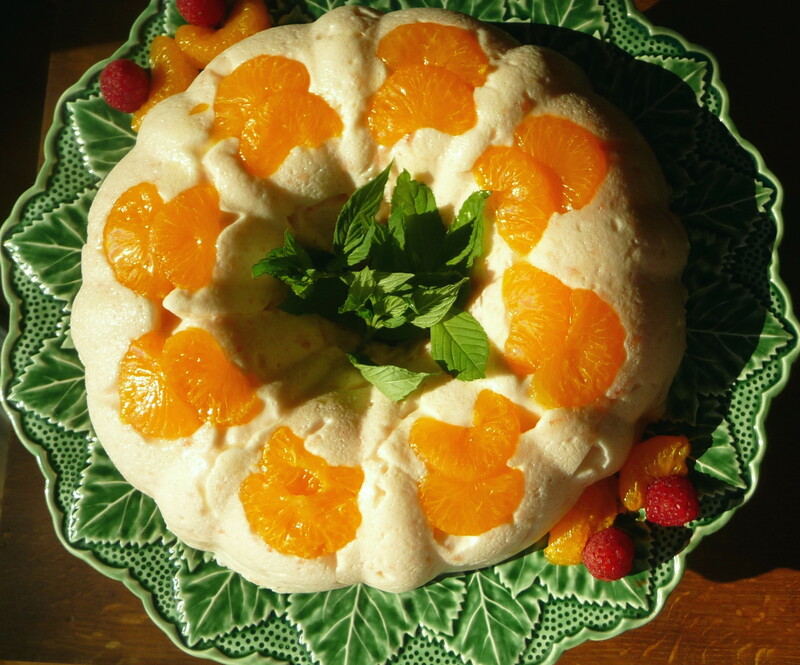 While I made an “apricot-free “apricot mold”, Jessie had a fun, refreshing, and subtle retro summer dessert recipe – one filled with history. Spray a Bundt pan or other eight-cup mould with unflavoured cooking spray or oil lightly. Empty two packets of Jell-o bowl and add 1 cup boiling water, stirring thoroughly until all crystals have dissolved. 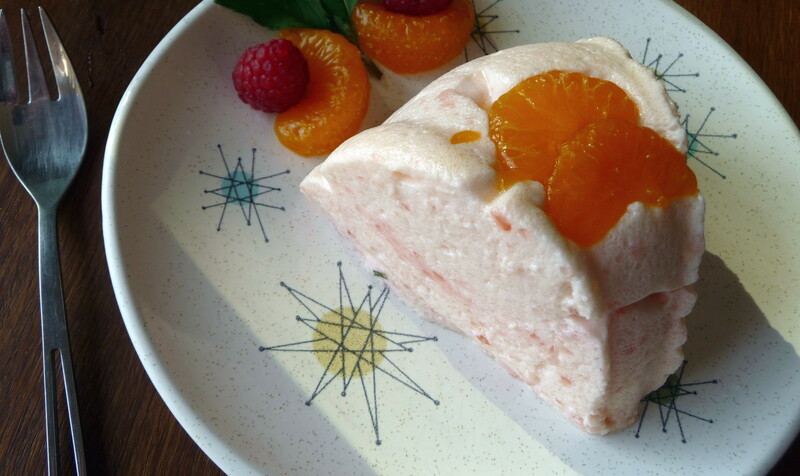 Place Jell-o bowl (covered with plastic wrap or a plate) into fridge for 30 minutes or until the consistency is just thickening slightly, like raw egg whites (I let mine go a little more solid, and it made it harder to achieve the perfectly mixed ethereal texture that is this dish). Do something else for a half-hour! Near the end of the 30 minutes, take your chilled can of evaporated milk from fridge and whip in stand mixer, with whisk attachment, on high, until soft peaks form. 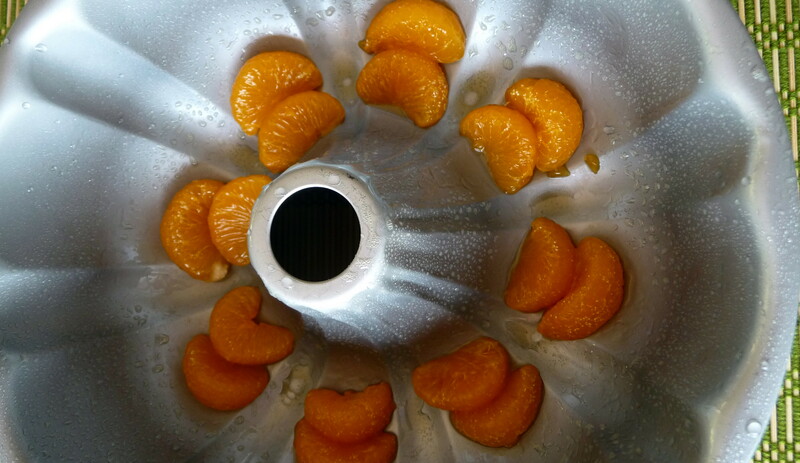 Place mandarin orange segments in the bottom (which becomes the top of the mould, when inverted) in a decorative pattern. Switch beater to paddle, and use lowest setting to fold in thickened Jell-o. Pour the Jell-o mixture into the mould carefully, making sure not to move the oranges, if possible – spooning dollops can work well, alternatively. Think of the days when Jell-o moulds reigned and apricot flavour was easier to find. 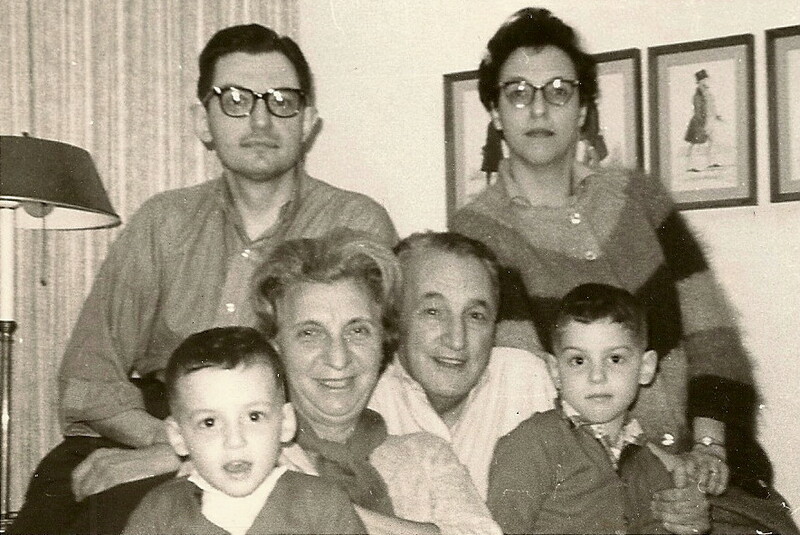 This entry was posted in Blogs and Food Writing, Dessert, Recipes Misc, What Would Jessie Dish and tagged Dessert, easy, fast, light, Old-Fashioned Cuisine, Vintage Recipes. Bookmark the permalink. p.s. I bet Jessie would have dished this dessert with Agar Agar too had she known about it (smile)! I was trying to think what we have instead of Jell-o and then I remembered: we get Rowntree’s Jelly. Little cubes that you have to melt in boiling water and then place in the fridge to set. I’ve never had Jell-o – is it presented the same way? My favourite flavour was raspberry or strawberry, but it always smelt better when it was dissolving in the boiling water as opposed to when it had actually set. PS: Apologies for the random tangents in this comment – I’m clearly quite tired. Jax,I don’t know Rowntree’s (though don’t they make the chewy confections, such as Wine Gums – neither winey nor chewing gummy – and such candies?). When you’re here for a Kiwi-wannabe-Canandian visit, I’ll make you an even more colourful Jell-o dessert. When I was in highschool I had a temp job counting inventory at the local Co-op grocery store on New Year day for about five years in a row. Every year I had to count all the boxes of Jell-o. I am certain that I never counted a box of apricot Jell-o, so my guess is that it hasn’t been available in Canada for some time. Great read, thanks. I have never seen Apricot Jell-o, and now I will have to have a better look. My husband loves jell-o of all kinds. He likes it for breakfast on his toast, weird. Last year we were driving to Florida and I can’t remember exactly where but there was a museum for Jello-o, now I think we might have to have a visit and check it out. My grandmother used to love making jell-o, too. But she didn’t bathe in it, to my knowledge. 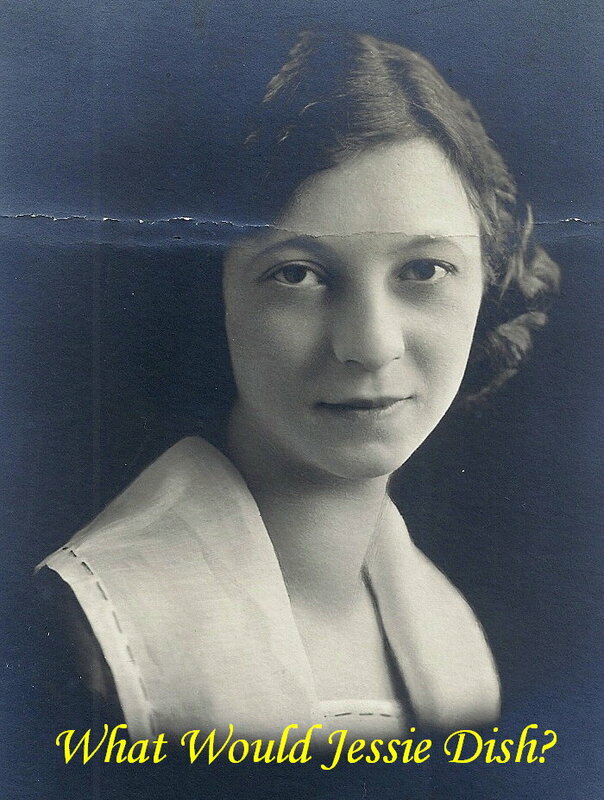 I doubt that my grandmother bathed in apricot Jell-o, either, but I really don’t know what she did in private….who knows, maybe my classmate knew a beauty secret involving that flavour I can’t find in Canada.